Molly Todd, a Teacher on Special Assignment who is overseeing the Integrating Technology Engineering and Math/Science (iTEAMS) grant gave an update to the Board on the initiative's progress. iTEAMS is a professional development research project designed to provide teachers with support to deepen their content knowledge and pedagogy to promote STEM education aligned to the Common Core State Standards in Mathematics and Next Generation Science Standards. This is the first year of the three-year, $1.5 million grant serving 58 teachers - 32 of which are from SRCS - and their students in grades 3-8. Glenwood third graders Lucy and Leyla talked about what they learned in an engineering earthquake project and Maggie, a Davidson Middle School eighth grader, highlighted her learning from a unit on density of liquids. A video created by Sun Valley Teacher John Flanagan was shown, which brought to life many classroom projects and off-site explorations. Lastly, Davidson Middle School teacher Adam Singer shared how he has shifted classroom projects thanks to iTEAMS and how he has seen deep thinking and learning his students are doing as they move through projects in building bridges and 3D printing, noting the iTEAMS approach encourages students to iterate to improve upon their projects as they are building their projects. Trustees expressed appreciation for the valuable lessons iTEAMS is building for students: you need a strong base; don't give up; learn from each other; have a willingness to try new things; and the value of discipline. Molly Todd, Project Coordinator for the Integrating Technology Engineering and Math/Science (iTEAMS) grant gave an update to the Board on the initiative's progress. iTEAMS is a professional development project designed to deepen teachers' content knowledge and pedagogy to promote STEM education while aligning to math and science standards. This is the second year of the three-year, $1.5 million grant serving over 50 area teachers - 29 of which are from SRCS - and their students in grades 3-8. Ms. Todd reviewed this year's project "Waterways and the Bay," highlighting the opportunities for iTEAM teachers with the Exploratorium and San Francisco State University, as well as fieldtrip activities for students. She shared that teacher surveys show increased confidence in teaching the New Generation Science Standards and have appreciation for the opportunities of collaboration with their colleagues. 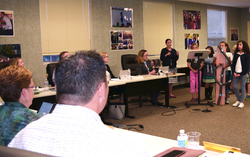 iTEAMS teachers Molly O'Donoghue from Laurel Dell Elementary and Ranae Roemer from Davidson Middle School and their student presenters also shared their experiences with the Board. Ms. O'Donoghue's fourth grade students reported their challenges and successes with static, kinetic and potential energy projects and Ms. Roemer's eighth grade students reported their learning experiences with engineering activities. Click here to learn more about iTEAMS. Molly Todd, Project Coordinator for the Integrating Technology Engineering and Math/Science (iTEAMS) grant gave an update to the Board on the initiative's progress. iTEAMS is a professional development project designed to deepen teachers' content knowledge and pedagogy to promote STEM education while aligning to math and science standards. This is the third year of the three-year, $1.5 million grant serving over 50 area teachers - 29 of which are from SRCS - and their students in grades 3-8. Ms. Todd reviewed this year's theme, "Movement and Transportation," highlighting the opportunities for iTEAM teachers with the Exploratorium and San Francisco State University, as well as fieldtrip activities for students. She shared that teacher surveys show increased confidence in teaching the New Generation Science Standards and students engaging in more hands-on learning. 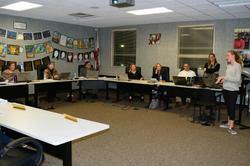 iTEAMS teachers - Angela Hood from Glenwood Elementary and Ranae Roemer and John Flanagan from Davidson Middle School - were joined by students in their classes, and they discussed their experiences with the Board. Dozens of pictures of cartoon characters cover the tables at the San Rafael City Schools' District office boardroom. Groups of teachers are arranging the pictures to form a storyline according to inferences made from the pictures' details. Larry Horvath, Assistant Professor of Secondary Education at San Francisco State University (SFSU), explained, "Not all science has controlled experiments. Evolution and geology require claims from evidence and inferences from that evidence."